Training and Support: Training consists of an initial 3 days of theoretical and practical training as well as 6 monthly refreshers. Ongoing support is provided to all Franchisees. Marketing Support: Initial marketing support is provided. Agree Terms: 5+5. The franchise term is 5 years with the option to renew for a further 5 years. Since kicking off in 2016, Billy Slater’s Billy’s Buddies Programs has expanded across SEQ, Sydney, and most recently Cairns, with more than 250 locations and over 2,500 children participating in the Program every week. 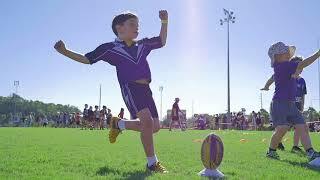 Runner Up at the What’s On 4 Kids Awards in 2018, Billy’s Buddies is a non-contact Basic Ball Skills Program owned and developed by Billy Slater. The Program is designed to enhance children’s hand-eye coordination, gross motor skills, confidence and self-esteem in a fun and safe environment. By becoming a Billy’s Buddies franchisee, you will be assisting in the physical development and growth of our young children! Billy’s Buddies is now offering franchises across QLD and NSW. Visit our website for further information.